It's been a busy last few days. 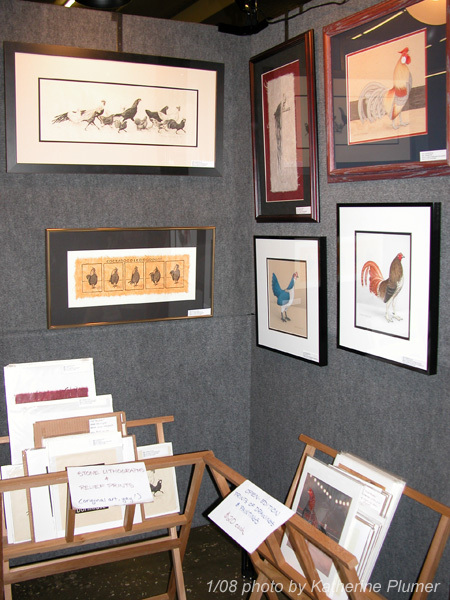 I took 15 birds (plus 5 sale birds) and the art booth setup down to the fairgrounds on Friday afternoon and got that all set up, and then came back home that night since it's not all that far away. I left here at 6:30 in the morning on Saturday (ugh!) and drove down there for a very hectic day. 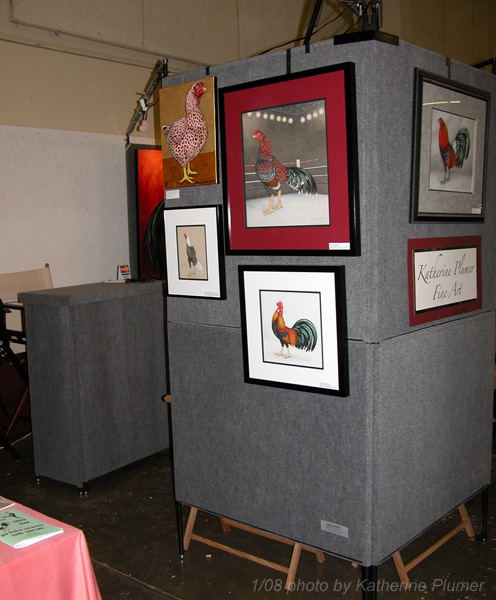 After getting my birds are tidied up and selling a few birds over in the other room, I finally got my art booth all set up and spent much of the day sitting there. As always the downside is I don't get to see *anything* else. I barely saw the birds, and if people don't stop by the booth then I barely see them either. And it's one of those shows where everyone always has a million things to do, so once again I'm left with this feeling of barely seeing some people I would have liked to talk to more. That's just how it goes I guess. 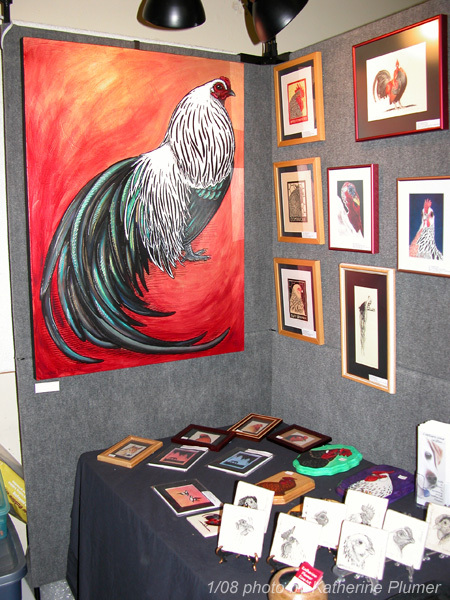 Sales went pretty well, and between the art and chicken sales I did quite well. The booth, with the "two corner" setup. I like this arrangement, it's like the abbreviated version of the full 10x10 three sided setup (which is WAY too much to deal with at a show like this one). As for the judging of the birds, on the other hand, well that's another story. Let me first say I'm not a sore loser. I don't mind being beaten by a worthy opponent. But I have a big problem being beaten by a bird that does not deserve it. 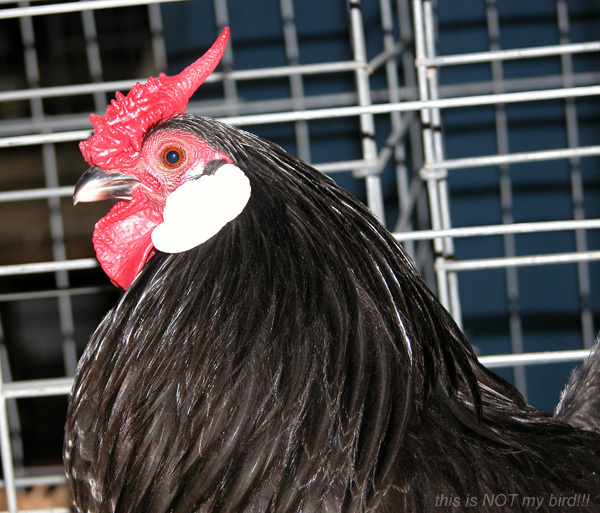 The best of breed cockerel (NOT mine) had white in his face. 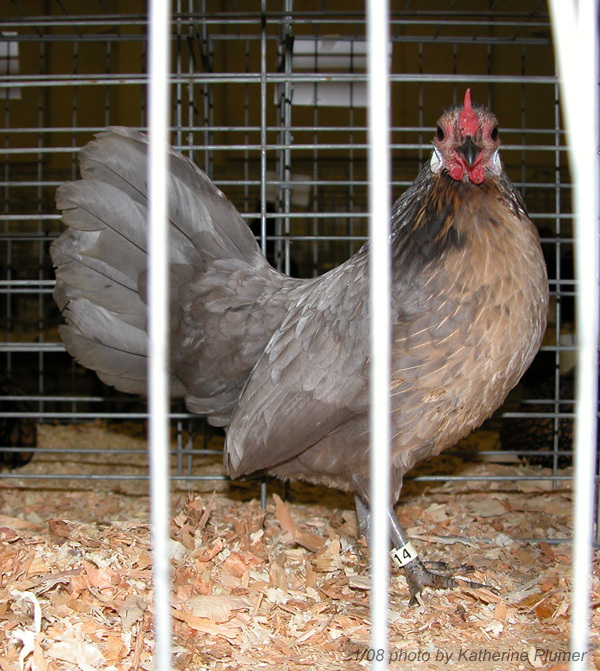 It would have to be "positive enamel white" to be a disqualification, and maybe it wasn't quite white enough to be a DQ, but there is no way in heck that a bird with a defect that serious should have taken the breed award. And reserve of breed went to another cockerel (NOT mine) with slightly less white in his face, and a severely folded ear lobe. I don't say this often but I'm going to say it now. WTF?????? That's just wrong, and it pisses me off. Neither of those cockerels would last a minute around here, I would not tolerate either of those faults. My black cockerels did not place higher because they are a bit low tailed. That's a big improvement over white-faced though. The judge evidently liked one of my BBRed males (same one who did well last weekend) but because they are only standard in the ABA and not the APA he would not consider him for a breed award. 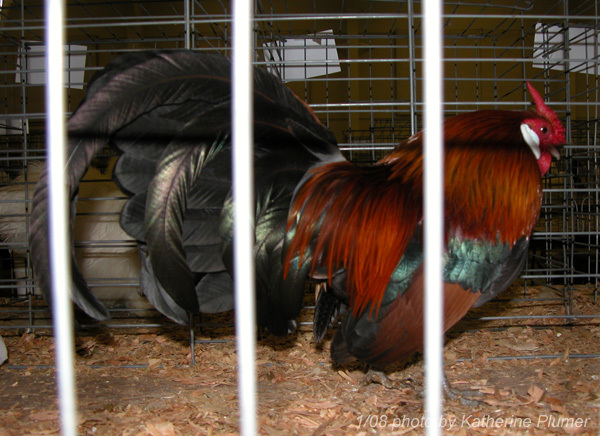 Some judges just won't do that, and it bugs me, because as long as the poultry show is sanctioned by both organizations, even if a color is only recognized by one or the other, it CAN win. A color that's not recognized by either (like my brassies or blue brassies) cannot win. The bird that won the class. This is a bad photo but the only one I got in focus. I know the flash has washed him out but that white spot above his ear lobe, that's white on his face and is a serious serious serious fault!!! 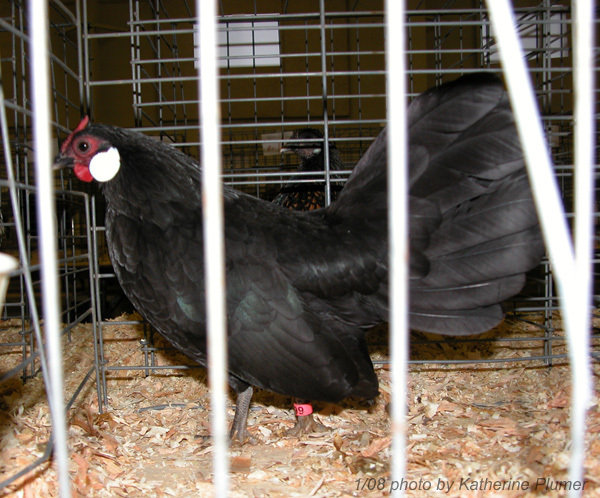 My black pullet that didn't place. She looks great in this photo! At least I had fun visiting with friends and did well with the art. The banquet was nice, and once again our table won obscene amounts of wine in the raffle. Oh, there was much talk this weekend about last weekend's "entertainment" and lots of photos passed around (at the banquet, cripes!) and lots of "I had no idea you did that." Tee hee! No chicken parties this time around, so I invited CS and DW over (I stayed down there in a hotel last night) and we sat around and yacked til midnight which was great. Needless to say it was hard getting up this morning, and I'll admit I zonked out for a few hours when I got home. So.. onward I guess. Not much I can do about it. Thanks for the honesty, its hard to say those things sometimes, Kevin and I thought the judging of rosecombs a little off too. Being still new to this I'm glad you spoke up. Otherwise we use the judging to learn by. Kevin's comment, "I don't think that judge knows much about rosecombs". Sometimes he's smarter than I know! He did manage a 3rd place in showmanship, better than he expected. "So.. onward I guess. Not much I can do about it." Tail feather extensions... expensive, but "they" will never know. Rose and Kevin - definitely don't base any judgement of your birds on the way things went this weekend. Maybe it was okay for the other breeds but most definitely not the RCs. I wish I would have had more of a chance to talk to you, I'd have been happy to go through the birds with you. I'm glad Kevin did so well in showmanship, please pass on my congratulations. Those classes are tough! Bry - your comment makes me think about those tail extensions that people put on horses and how completely fake those look! And talk about expensive, hoowee!